Are you old enough to remember life before the internet? I am, but it still feels like it’s always been here. I distinctly remember hearing a news item about it when our children were quite small and thinking: We’ll never have that, it’ll be far too expensive. I had no idea that the web would totally transform my life. It’s a form of magic, really. A dozen years ago I was office bound in a job I’d outgrown. I was happy enough but not challenged or fulfilled by my work. I couldn’t really see an alternative. I was in my late forties and vaguely dissatisfied. My dilemma was I didn’t know what I wanted to do, but I was very clear about what I didn’t want. I didn’t want more of the same. I wanted to be more in control of my destiny. After a period of reflection, and some time spent on my own personal development, I chose self employment, and self employment has now become a limited company with a thriving global training business. And I couldn’t have done what I have without that very internet I thought was some magical idea way off in the future. In the last few months, to my huge delight, a course I wrote for women soon after I left ‘proper’ work has been delivered to women in the US and in Australia. It’s been delivered by women I trained and support via the internet, as well as by those UK based who came on my training days. I am amazed and somewhat humbled. 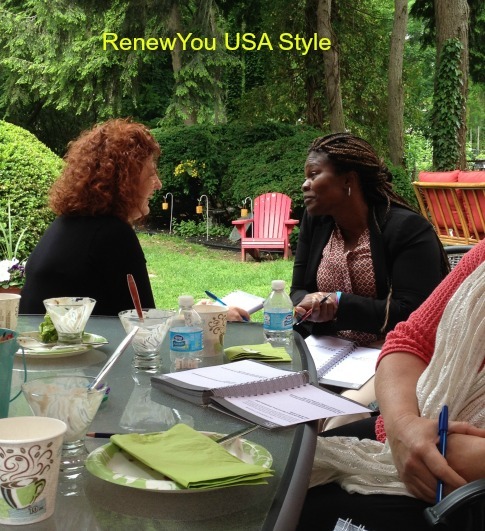 I knew that Jane’s RenewYou workshop was an amazing program which is why I was so pleased to become her first licensed trainer in the United States. I was confident that the women who attended would be as uplifted and inspired as I was when I went through the program. And I was right. What I didn’t anticipate was the amazing burst of energy and inspiration that I’d receive every time I facilitated the workshop. It’s more than the feedback and good feelings from the group that leave me feeling so enthusiastic. It’s the content of the workshop itself. Each time I deliver the course, I learn something new about myself and come away with new ideas for my business and my life. I return home energized, my mind racing with all sorts of new ideas that I can’t wait to put into practice. It literally takes me a day or two to come down from my mental high. Laura J Mansfield, USA. Thank you Laura for allowing me to share that. I don’t know how to put it other than that it genuinely feels like magic. A huge thank you to all my trainers who have taken part in the licensing since we launched in March 2013 – you’re wonderful. P.S And a massive thank you to the technology folk who made it possible. RenewYou is truly the gift that keeps on giving – all year long. If you’re looking for a special holiday or birthday gift for someone consider a RenewYou gift certificate. You can bet they’ll never want to “re-gift” it.